Happy Friday! It has been a strange week here at the From Scratch household. Between a third week of Christmas break (yes, my daughter’s school district has a 3 week winter break…), head colds, and cable/internet/phone problems, things just didn’t feel normal around here. This is a long way of saying I didn’t make this week’s (dreaded) French Fridays with Dorie recipe. I will make it next week when things are hopefully back to normal. Instead, I will catch you up on a couple of recipes that I made in December but haven’t had a chance to write about. Let’s get started! 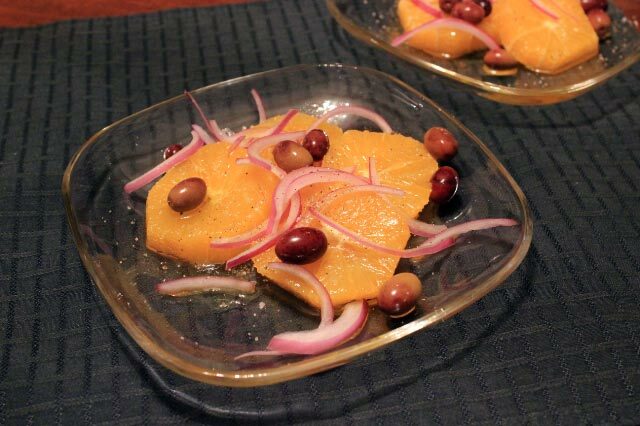 Orange and Olive Salad. This is one of those recipes from Around My French Table that I was dreading the most. It just didn’t sound good to me. But, since I’m committed to trying every recipe, I carried on. Much to my surprise, I liked it! I especially liked how refreshing the orange seemed with it’s drizzle of olive oil and a sprinkling of salt. I also liked the onion with the orange. But I found my mild Niçoise olives did nothing to add to the flavor of the salad. Perhaps a saltier kalamata would have been better? Regardless, I was pleasantly surprised! Next up is Pan-Seared Duck Breasts with Kumquats. Except I used boneless chicken breasts. 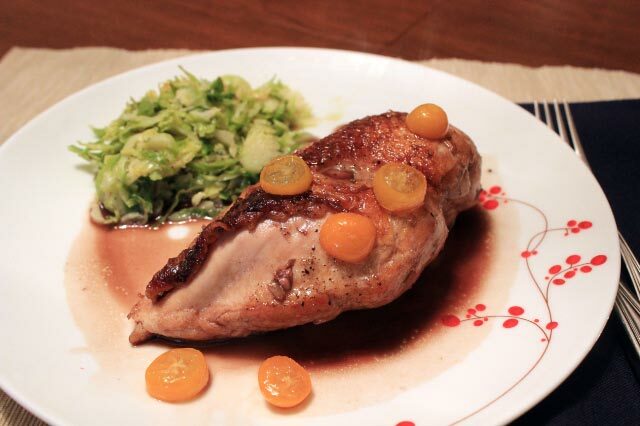 This recipe is all about the kumquat sauce and I knew my family would prefer chicken over duck. Despite my change to chicken, I followed the recipe pretty closely. I made the sauce and candied kumquats as written. The chicken was pan-seared skin-side down just like the duck would have been, but then I kept it in the pan and roasted it in the oven until cooked through. This was good! I had never cooked with kumquats before and it was fun trying something new. The sauce was good with the chicken and my husband loved the candied kumquats. I would make this again. If you are interested in what the dreaded recipe for this week was (and don’t want to wait until I write about it next week), you can find out here. Here’s to a good weekend and a more normal week ahead!